with 5 Popular Connector Tips (+ $9.95)without Connector tips. Standard Package only. 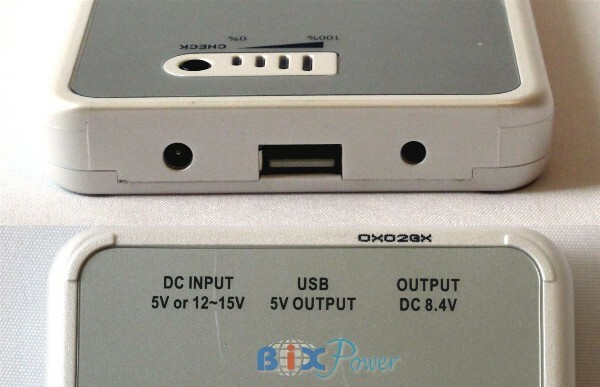 This battery has a 5V USB output port, a 8.4V output port and a input port for charging the battery. The battery standard package comes with a PM55 battery, a AC charger, a USB port output cable, a 8.4V port output cable. 5 most popular connectors are optional. Not included in the standard package. Connector G4: DC Power Connector Plug Tip with 5.5 x 2.5mm Round Shape Connector. Connector G5: DC Power Connector Plug Tip with 3.5 x 1.35mm Connector. Connector G6: DC Power Connector Plug Tip with 4.75 x 1.75mm Round Shape Connector. Connector G56: DC Power Connector Plug Tip with 5.5 x 2.1mm Round Shape Connector. Charging time: about 3 to 4 hours using AC quick charger, 6~8 hours if charging from a computer USB port. High capacity, Long Run Time. This battery has 21 Watt-hour (Wh) capacity. For your reference and comparison, most Digital Cameras/Video Camcorder's standard batteries only have 5Wh capacity. 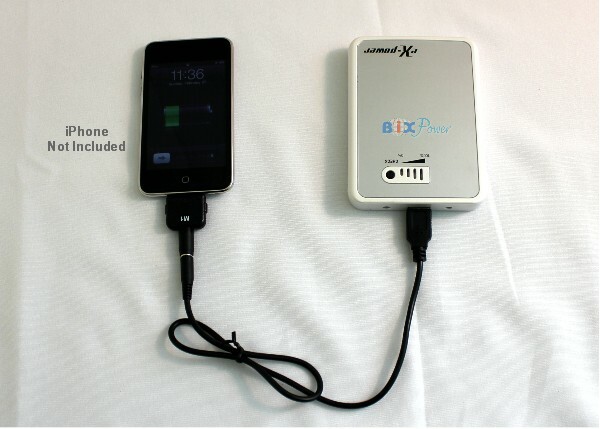 A typical cell phone or iPod battery capacity is only about 3Wh, a iPhone internal battery capacity is around 5Wh. This battery can fully recharge the iPhone 4 times, extending your talk time by up to 50 hours, standby time by up to 1000 hours, Internet use by up to 30 hours, video playback by up to 40 hours and audio playback by up to 120 hours. AC quick charger included. Temperature and over-voltage/current protection. 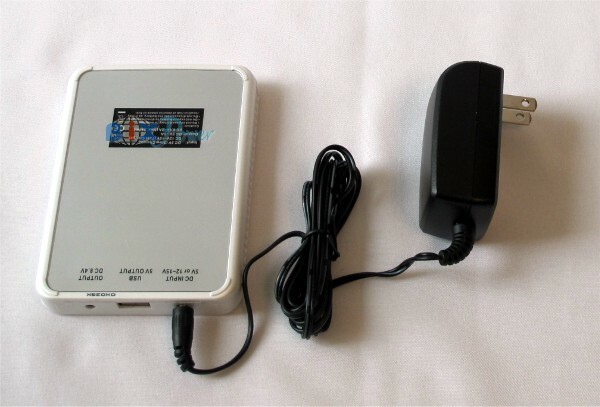 Can also be used as an external power supply for any device such as portable Radio, CD/VCD/ DVD player etc...which requires 5 volt or 8.4V power. 1. Charge the battery: This battery has its own AC charger. You can charge it from any 110V or 220V AC power source with the included AC charger through the "DC IN" port on the battery. This battery has a USB port with 5V DC OUT and a regular round output port with 8.4V DC out. It also comes with a USB port output cable and 8.4V output cable. Please check your device DC power input voltage requirement so you can use the correct output port to power and charge your device. Normally, you can find the DC input voltage label near your device DC power input jack. If not, then check your device AC power adapter "Output" voltage, which is same as your device input voltage. After confirming your device DC input voltage requirement and correct battery output port , you can then select correct output cord and Our optional Consumer Electronics Plug Tips to use. With the connector tip not connected to the adapter cord, locate the correct tip by fitting it into your device DC Jack. The tip should fit snugly in the DC jack. Our optional Consumer Electronics Plug Tips will make this battery works for a lot of devices that need 5V & 8.4V DC power. Connect the output cord to correct output port, then connect the output cord with correct connector tip to your device DC power input jack (which is the same jack AC power adapters usually plug into). Now you can use this battery to power your device directly or use it to charge your device internal battery. You may order the battery with 5 most popular connector tips . Connector tips are optional, not included in the standard package. 5 most popular connectors are optional. Not included in the package. Connector tips are optional, not included in the standard package. * This battery is recommned to use with devices that can be powered or charged from a computer USB port. If your devices need output current larger than 1 A (1000 mA), we recommend to use our PM85-25 or PM85-50 battery. Our optional Consumer Electronics Plug Tips. will make this battery works for a lot of devices that need 5V DC power. Click on above picture to see the optional available plug tips. If you are using the round output port with 8.4V voltage, please note that the default battery output cable and connectors are configured as positive polarity, which meet the needs of most of devices. Please make sure your device polarity is positive, if not, you can not use this battery. Positive polarity means inside the connector is positive, outside the connector is ground. It is CRITICAL that you determine the correct polarity needed for your device before using the battery. FAILURE TO DO SO MAY RESULT IN SEVERE DAMAGE TO YOUR PRODUCT! To determine the correct polarity for your device, inspect the DC adapter jack or the label of your product thoroughly for information about the products polarity. There will be a symbol with a plus sign on one side and a minus sign on the other with a circle between them. The circle will have an opening so that it looks like a "C". If the opening of the circle is on the side with the plus sign the polarity is positive. If the opening is on the side with minus sign the polarity is negative. If you cannot find a polarity sign on your product you need to call the product's manufacturer to find out what the polarity is.